I was asked why I encourage artists to have cards made of their work, when surely an artist would prefer to sell an original painting or illustration? 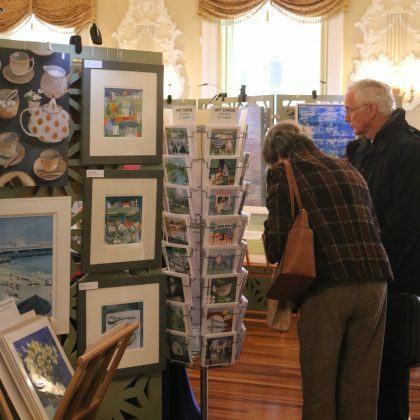 Artists who exhibit at #Cafdgg Contemporary Arts Fair Discover:Gather:Give bring cards of their work as they are readily affordable often between £1.50 to £8.00 and always sell well. I would suggest one should never under estimate the power of a card; a simple card can be the beginning of a relationship with an artist that can last a lifetime. In many ways it is better than a business card as not only does it have all the relevant contact information printed on it, the card can show more clearly a sample of the artists work. With a card you share your view of the recipient with them, it can be as with Ken Hurd’s work, a scene from a place you love in Wales, or Claire Henley shared passion for Cornwall, it can be a whimsical memory from Kate Wrigglesworth and Anya Simmons, or the touch of wild seascape by Judith Yates, maybe Chloe Breen’s food inspired repeat patterned circles or Ben Cowan’s political satire; each artists shares their work at a price where one can gather a handful of cards and once framed they become your collection. A card can be shared, given at special and meaningful moments, to send love, friendship or ask forgiveness, to make someone’s day by saying you were thinking of them, to celebrate a new beginning of life or share a cherished memory of a life lived – a card gives so much more than you may first think, it is a human lifeline and the ultimate gift.